Here's an interesting and timely story from St. Louis that appeared in the New York Times, March 31 2005. If you do not have a New York Times account, I've archived the article. And a related article about the downtown revival of St. Louis appearing in yesterday's New York Times. 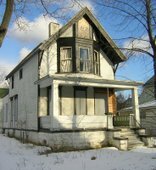 This house is located at 212 Best Street. According to City Hall, Archie Callahan is the owner of record. It's a 3/3 double and it's currently assesed at $19,000. There is no file over in Buffalo Housing Court on this property. According to neighbors its been looking like this for years. This property is located directly across the street from City Honors High School. My experience suggests that 212 Best Street is available for purchase despite the lack of a "for sale" sign. If you are interested and would like some assistance in tracking down the owner, please contact me. The City of Buffalo would pay the cost of extraditing a California businessman accused of failing to renovate 56 dilapidated properties, an official said Tuesday. Assistant Corporation Counsel Peter J. Savage III said Mayor Anthony M. Masiello has agreed to pay the extradition costs for Joy A. Drati "given the county government's financial problems." First Deputy District Attorney John J. DeFranks said Tuesday he will know in about two weeks if there are enough legal grounds to justify cross-country extradition proceedings for Drati. 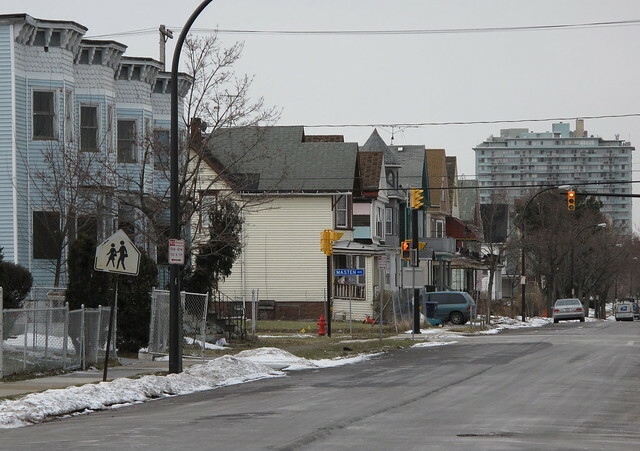 Buffalo Housing Court Judge Henry J. Nowak is slated to begin a series of demolition hearings next month to consider safety and other factors linked to the 56 Drati properties in the city. Smells like we are entering an election cycle...I'll be following the case and examining the costs of extradtion, too! This house is located at 2 Girard Place. According to City Hall, Cedric Walker is the owner of record. It's a 3/3 double and it's currently assesed at $3400.00 (no typo). There is no file over in Buffalo Housing Court on this property. According to neighbors its been looking like this for years. This property is located two blocks away from East High School on Northampton Street where 25 million was recently spent on renovations under the Joint School Construction Project. Other houses on the block include this property at 31 Girard Place. My experience suggests that 2 Girard Place is available for purchase despite the lack of a "for sale" sign. If you are interested and would like some assistance in tracking down the owner, please contact me. It's a mythic city for African-American culture and politics and it's a mythic city for certain kinds of modernism in art - Diego Rivera's DIA murals are world-renowned. Lafayette Park by Mies van der Rohe is world-renowned. This is a city that has been a glorious city. I've always loved this city, but I'm distressed by the abandonment. Check it out. There is audio interview in that link, too. The documentary's debut was Friday in Ann Arbor. Follow the reviews from the blogs below. Why are you building new structures, spending millions of dollars building new sports structures and entertainment centers, when you have the historic heritage of the city's right here abandoned across the street. To a European it's totally incomprehensible. Wacquant is nearly speechless as he gazes at vacant houses with sagging porches and trails of stained brick leading from the walls to the weed-choked lawns. Make sure to check out these Detroit sites, for additional urban news...and reviews of the film, Detroit: Ruin of a City. Here there is an extensive discussion about the debut of the film Detroit: Ruin of a City. Just scroll down to the 29th conversation. 90 different impressions of the film. Detroit Free Press March 16, 2005 article and review of the film. Permanent Revolution - Because real educational reform doesn't just happen at weekly school board meetings. We need a continual dialoge to effect dramatic change. Now, how many of our other elected and anointed leaders have a blog? A+ Florence...your commitment and willingness to embrace innovate social and technological change benefits the entire community. I'll be indexing various posts and information about the Queen City Farm project in this archive. You may also want to bookmark the Queen City Farm site and Queen City Farm blog for current information. If you haven't seen the Queen City Farm Film, you should. It was produced by John Paget - Paget Films. 1/25/07 194 East Utica on Life Support? New York Times reviews the independent film "The End of Suburbia: Oil Depletion and the Collapse of the American Dream." "If the cost of energy skyrockets, are the suburbs doomed? Would Long Island, already paying among the highest fuel and electricity rates in the country, become an unsustainably expensive place to live? I had the unexpected opportunity to tour the property located at 669 Genesee Street recently. I am not a structural engineer, general contractor yet after 15 years of real estate experience here in the city of Buffalo I realize that this could be an extraordinary urban opportunity. This is a city owned property and occupies half a city block. The primary building has three floors (50x100) and the two additional buildings on the property are smaller. In addition, city records show that there are two additional vacant parcels adjacent to the main building. Here's the official property description from City Hall. The main and secondary building appear to be in good structural condition. The mechanics have been stripped. In addition to the property, the new owner would get 24 rolls of blue vinyl 8' by 500 each (think Christo!!! ), a bunch of too cool deco chairs, 2 chopped-up suvs and 4-5000 library books! Craig, from Buffalog, just passed along additional pictures of 669 Genesee Street. Most of those are 669 pics, some not. Craig also shared this aerial view he grabbed. Here's a cool satellite view, too! Make sure to check out Craig's account of our recent tour! My experience suggests that this building could be purchased from the city for less than the price of a tall house coffee on Elmwood Avenue. The building presents some immediate liability issues and so you would need the advice and guidance of a competent real estate attorney who is familiar with the acquistion of city property. To complete the deal you'd probably want to present your plan to Housing Court Judge Nowak, too. You would be a Housing Court Hero! A drug dealer made the top floor their pad about 10-15 years ago if i remember correctly. Genesee Street has any number of great buildings that will go the way of the bulldozer. If these buildings were secured, cleaned up, and MARKETED the city could begin to make a small dent in the problem. Problem is, the dreamers are never the ones with the money to do these projects. Like, what would it take for the city to re-direct some of the funding for the demolition and properly secure, board and moth-ball the building for future use. Is this to innovative and creative for our elected official to understand...Am I expecting too much? David Franczyk still doesn’t get it. He’s asked Westchester Assemblyman Richard Brodsky, who just happens to be the democratic front runner for NYS Attorney General, for some help in saving the trees down in Perrysburg. Here's the Buffalo News article. It’s understandable that David Franczyck would like to save the trees in Perrysburg. His forest disappeared a long time ago. It use to be known as the Fillmore District and is now home to more blighted buildings per block than any urban center this side of Calcutta. A recent walk down Koons Avenue last week demonstrates the neglect and lack of serious attention to our urban core. I counted 19 houses boarded and vacant in a two block stretch of Koons Avenue. I mean there were only 50 houses on the street. Assemblyman Brodsky is no stranger to attention and controversy. When some Scarsdale, NY soccer moms didn’t think their kids should take standardized tests, Richard Brodsky was there claiming that Westchester kids should opt out of these tests. He even sponsored legislation about that. He is now trying to endear Buffalo residents to his “good government game” by assisting David Franczyk in thwarting the Trathen deal for good. That is not good news. I first started writing about this deal a few months ago. I’ve archived Buffalo News articles and letters, too. This is good news. New York State has a very transparent process in selling surplus property. H. Carl McCall, Buffalo control board member and former NYS Comptroller was trying to sell the site years ago. No takers. 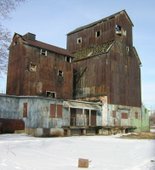 This process is good for every NYS taxpayer and perhaps a model that the city of Buffalo could follow in un-loading buildings (Wollenberg Grain Elevator on Koons – David) that it owns and refuses to maintain. The argument that Franczyk uses is disingenuous, self-serving and altogether misleading. He is trying to build a case that the old JN Adam Tuberculosis Hospital is worth a whole lot more than what Tom Trathen is willing to pay for it. Fully functioning and operational, sure. Thing is Tom Trathen has a solid track record of running a good business and has the support of environmental groups. The forward liability costs for Buffalo to absorb the property if the deal falls apart would be extraordinary. According to Perrysburg Town Supervisior, Myrton Sprague, the Trathen deal is the only viable bid in a decade. We all know that something is really only worth what someone else is willing to pay. For example, let’s take a look at some other real estate. You might think that your two-family house on Gibson or Playter Street (Broadway Market area) is worth 30K because that is what the city assessment says. And you further believe this because you have been paying taxes for 15 years based on this inflated valuation. Yet the reality is the house won’t even sell for 10% of its assessed value. In most cases you can’t even pay a buyer to take a house in those neighborhoods. Furthermore, many banks refuse to take back Fillmore District property during mortgage foreclosure proceedings. Reason, these properties are liabilities and have lost their asset value. The three other reasons…location, location, location. Rather than killing the deal in Perrysburg, David Franczyk’s time would be much better spent here in Buffalo focusing on core-urban issues and what’s left of the Fillmore District. How about helping your neighbors lower the 30K assessment of their homes to reflect the true $1000 value. To make matters worse NYS Assemblyman Richard Brodsky is trying to make a name for himself outside of his toney Westchester District just in time for next year’s state wide primary push. He will most likely battle Andrew Cuomo for NYS Attorney General. Assemblyman Richard Brodsky has finished playing the “good government game” in Monroe county by investing alleged fraud in how businesses receive favorable treatment in the state’s Empire Zones. It was a fake investigation. That sort of protectionist game coupled with Franczyk’s paternalism and elitism - “I know what’s best” - got us into the mess. We are being played, again. Common sense tells us that when you are in over your head, you ask for help. David, Tom Trathen returns calls. Get the deal done, limit our liability and focus on core business. It’s that simple. Kind of makes you wonder…if the Fillmore District were an actual forest, the Sierra Club might be leading the charge against David Franczyk for his failed stewardship, don’t you think? Here's the latest news from the Artspace website. The success of this development for the emerging arts and educational neighborhood here in Masten is critical. In recent months we have learned that the permanent home of Performing Arts High School is just a few blocks away. I've written a few posts about Artspace recently. Here's the information on an innovative arts and urban planning conference scheduled for later this year in Toronto. It's the sort of thing that Artspace promotes. Here you'll find a number of posts about a City owned building that used to be located at 669 Genesee Street. The banner photo for this blog was shot from the roof top the day before the building was demolished. This list represents some of the buildings, issues and places that are tracked on fixBuffalo. I'll archive writing about Buffalo and keep track of it here. Follow Bishop Kmiec's "journey to avoid housing court" and matters relating to the catholic church's shrinking in Buffalo, NY. Occasional comparisons to how other Catholic dioceses across the country deal with similar matters including abandoning inner-city property, “demolition by neglect” and housing court issues will be presented. A collection of writings documenting what I consider to be a defining characteristic of 21st century urban life. Here a few promising blogs that are delivering news you are not necessarily going to see in the New York Times or the Buffalo News. Let me know if you have found other blogs that carry informative NYS stuff. 22 Waverly is located a few short blocks away from the future home of Performing Arts High School. Here's a picture from July 2004 and a recent picture that I took in February 2005. As you can see from the pictures, the house just sits abandonded, (not) boarded, derelict and vacant. Perhaps local officials are waiting for a story such as this from Detroit to happen here in Buffalo before something gets done. Interestingly, 22 Waverly was sold on 8/18/03 to NJ "investor" Charles Speller for $6K by notorious Long Island eBay scammer Jesse Isaacs who paid $3.9K on 6/30/03. Isaacs has had an outstanding arrest warrant from Housing Court for months, but continues to scam houses in Buffalo with no fear. You can view some of Michele's other housing activist work here, too. Read some of Richard Kern's ground breaking & blight busting writing on KernWatch. 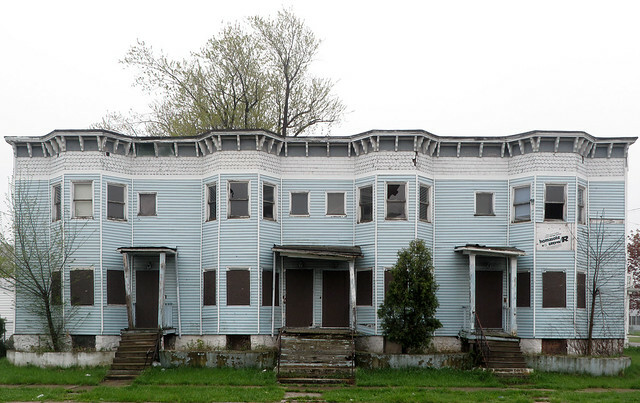 Maybe while the city's crew is out boarding up 22 Waverly, they could go around the block and finish securing the rear windows of the Woodlawn Row Houses - which just happens to be the primary subject of this blog and preservation initiative. Urban Homesteading, anyone? - No City Taxes! This home at 23 Waverly Street appears to be in excellent structural condition. I've never been inside so I can't tell you anything about the mechanics. I know a few realtors and very responsive real estate attorney that could assist you with this deal. I have no financial interest in this property other than how it will continue to stimulate neighborhood stability and enhance adjacent property values. Here's the property information from the city's website. With the Star Program, there are no city property taxes! It's described as a two-family home. It could easily be converted to a single. There are three new homes on this block. A few of the newer homes around the corner on Woodlawn and Ferry are rather substantial and make a strong positive contribution to this unique urban landscape. Don't forget that the newly remodeled Performing Arts High School will find its permanent home one short block away from 23 Waverly. I imagine that a deal could be made with the owners of this house that would be very advantageous to the new owner. Look at some of the other exciting developments that are happening here in this little 25 block area of Masten, Main/Jefferson -- Ferry/Utica. I know you are probably thinking, why here..."location, location, location"...as soon as you walk around the area your perception of this neighborhood will change...really. Let me know if you are interested in a neighborhood tour. 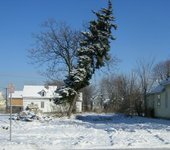 In the past week two additional - City of Buffalo - houses were demolished. Both of these structures were located with in a two block radius of the new permanent home of Performing Arts High School. 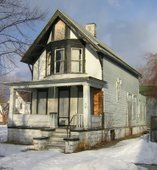 The house at 76 East Utica was located along the primary path Buffalo Traditional High School students used to walk as they lweft the Main/Utica station and walked over to Michigan and the two blocks to school. Both properties have been sitting here for years, two blocks from a school. While nothing like this has happened in Buffalo, yet... I have written this recently about abandoned, boarded derelict and vacant houses. While there seems to be an official list of city and privetly reowned property that is abandoned, boarded, derelict and vacant located with in a block of recently reconstructed city schools, very little seems to be done about the obvious public health and safety problems these properties present to city students and neighborhood residents. This little corner of Masten Main/Jefferson - Ferry/Utica that surrounds the site of the new permanent home of Performing Arts High School seems to be the focus of city officials efforts to deliver services and get rid of the problems. Six city owned properties have been demolished in the past 60 days. Here are the other properties that have been demolished in the past 60 days here in Masten. And the remaining abandoned, baorded, derelict and vacant houses with in two blocks of Performing Arts High School new home. Not all abandoned, boarded, derelict and vacant houses are good demo candidates. I've written about this, too. Check that out for two outstanding urban homesteading opportunities. Yet with out any program eminating from City Hall what are the realistic prospects for an innovative urban homesteading program coming to this neighborhood? Right, zip nadda...not until our annointed and elected officials begin to get creative and understand the real needs of our urban neighborhoods. If you follow these monthly up-dates you'll see the long slow process of "demolition by neglect" of one of Buffalo's historic landmarks. This building was designated a local landmark by the City's Preservation Board. It stands diagonally across the street from the former Buffalo Traditional High School - soon to be the future home of Performing Arts High School (September 2007). This building has been owned by the City of Buffalo since July, 2003.
update...February 2007 - if you are seriously interested in pursuing this project let me know. A local architect has recently completed a feasibility study that I can make available for your project. This map will orient you to 147-153 Woodlawn Avenue and this little 25 block corner of Masten bounded by Main - Jefferson and East Ferry - East Utica. Here's the monthly archive. The significant gaps in record keeping are synced with times that the row was under contract. I've compiled a flickr series with additional pics. I first started taking monthly pictures in March 2004. Here's the first pic from March last year. Click on the October archives - when I first started blogging - to see the other pics. They are in reverse chronological order so head to the bottom of the post to see all the pics. Here are the latest pics from last week. I've collected 152 signatures on the petition to date, 55 online signatures and the other signatures are from neighbors or from people who have attended various community meetings and have signed on to the petition. A very well respected local attorney, totally versed in Housing Court matters, has offered his services to bring this matter in front of Judge Nowak. I'll keep interested parties up-to-date here on those proceedings and over at Buffalo Issue Alerts. Meanwhile directly across the street from the Woodlawn Row Houses work continues on the new youth center. The major news for this little corner of Masten located between Main/Jefferson -- Ferry/Utica is the transformative urban news regarding Performing Arts High School's re-location to this neighborhood. The new Robert Traynham Coles inspired Erie County Library is closer to completion, too. Read about it here.